Amazon’s sales have fallen in states where it is now required to collect sales taxes, according to a new study by three economists at Ohio State University. The study offers striking evidence of how much Amazon’s dominance of the retail marketplace is owed to nearly 20 years of favorable tax treatment. The economists examined credit and debit card data for 246,000 households, focusing on five states that recently enacted laws requiring Amazon to collect sales tax: California, New Jersey, Pennsylvania, Texas, and Virginia. They analyzed household spending at Amazon three months before and after the law took effect, and then compared the findings to spending patterns in states that did not adopt an online sales tax law. Households cut their spending at Amazon by about 10 percent when the company begins collecting sales tax, the economists found. The effect is even greater for larger purchases. Spending falls 16 percent for purchases larger than $150 and 24 percent for those over $300. That sales tax still matters this much to Amazon’s fortunes is quite remarkable. One might imagine that the company’s size and efficiency, its vast online marketplace and formidable distribution logistics, would be more than enough to outrun its competitors. But in fact, not having to collect sales tax in most states still provides a significant competitive edge, even at this late date. We can only imagine how different the retail landscape might be today had Congress passed an internet sales tax bill a decade ago, when Amazon was big — it had revenue of $7 billion in 2004 — but not yet in possession of the level of market power it now has. Amazon posted $73 billion in sales last year. The retailer, which owns dozens of internet brands, including Zappos and Diapers.com, now accounts for a staggering one-third of all the items Americans buy online. As it grew, Amazon went to great lengths to ensure that it’s activities could not be construed as establishing “nexus” (a physical presence in a state) that would require the company to collect sales taxes. According to the Wall Street Journal, Amazon maintained a map showing states where employees were barred from traveling unless they were first grilled by a lawyer and outfitted with special business cards indicating they worked for a subsidiary, rather than Amazon.com, lest their activities trigger nexus for sales tax purposes. As Amazon’s growth necessitated more warehouses in more locations, the company bullied and bribed states to allow it build facilities without having to collect sales taxes on in-state orders. In South Carolina, for example, Amazon cut a deal with the governor, who promised the retailer could remain sales tax free in exchange for building warehouses that would provide 1,250 jobs. When the legislature voted to kill the deal, Amazon halted construction, resuming only when lawmakers backed down. By 2010, Amazon was operating facilities in 17 states but collecting sales taxes in only 4 of those. Amazon even went so far as to conceal its presence in some states. Texas officials, for example, were unaware that Amazon operated a giant warehouse in the state until the Dallas Morning News published an expose. When the state sued for $269 million in back sales taxes, Amazon threatened to shut down the facility and fire hundreds of people. The state eventually canceled the tax bill. 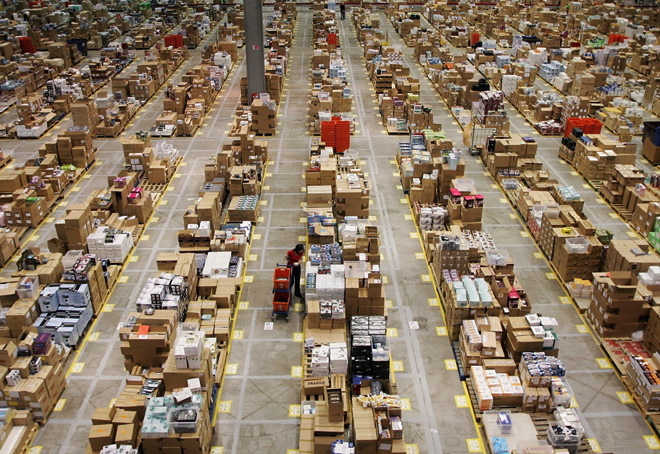 Between 2008 and 2012, when states without Amazon warehouses began passing laws that said large online retailers have sales tax nexus by virtue of their in-state sales affiliates, Amazon either filed suit, as it did in the populous states of New York and Illinois, or simply fired its sales affiliates, as it did in almost a dozen other states. In one of those states, California, Amazon not only fired its affiliates but threatened to spend tens of millions of dollars on a ballot initiative to overturn a 2011 state law requiring it to collect taxes. The company eventually agreed to a compromise that allowed it to operate sales tax free for another year.